Sorry to hear about your Grandfather as well, MKF. @Tyenkrovy; we don't have a no necro-posting policy at F3D. In fact, I don't even like that term. Since when did it become a crime for someone new to a site to comment on something that is a few months, or even a few years old? Necro-posting implies that art is no longer worthy of comment once it passes a magical, unknown number of days of age. If that were the case, why do people still talk about Picasso, Da Vinci or Michaelangelo? This site is about the art and art is always worthy of comment, no matter how old the image. Just to prove Im not dead yet. First image is the project other is showing the application, it wont be going onto this style of body but for my crawler. Which will be a VW bug or a comp truck body. Those are nice models. Is the car a slot or RC? Those graphics look nice on them. first is a 1/10 rally car second is a custom bodge 1/18 mt, both are RC. What I been doing instead of 3d in a creative manner on the pc, cant claim anything else that has been eating my time as creative >_> derp. Last edited by Madkoifish : 9th Mar 2012 at 10:29 PM. Last is that crawler body mentioned above. Also some have other's drawings in them. Mostly Reglue, UNO, cookie, and REMI, I think. hahah. zombie joke, the creator of Touhou used a horrible colour palette on Reimu (bow) and thus the zombie jokes started, recent game added this Tengu (ponytails) and her colour was off as well so, me being who I am. . . .
Colour is added. . . . .
Another dumb tengu is added. . .
yes, I read these books. I sheeped and read em then drew a pic in pchat out of serious boredom. WARNING girls kissing girls! so if you don't like it don't click, oh weed smoking and bad wennie jokes. Doodles at the bottom left to right By UNO Reglue me (the reimu) reglue (girl with umbrella I think) girl with hat me, jar me and the gap too. Top left is by Reglue, stoner witch, by me and the lesbians by me. underwear, ok. . . started in pchat and taken into Paint tool SAI Anyhoo it is a pretty crap pic, with a really crap reason, teen body with a HUEG HEAD. heh Shows 2 differing bgs for it. taken into SAI for planned colouring that never happened. Wriggle and a Yukka (later by Cookie) Text by someone else, Wall I think. freak frog, Suwako. The Sanae is by UNO?? or was it Remi? SORRY! Random junk. I had watched the remaster versions of Yamato recently when I did this. lol. Some Yukkuri torture and arcane refs to Lupin. A Yukari eating Peanut butter (suppose to be me cause I was horking the stuff at the time, I forget the chat that started it.) The witch yukkuri I think is by remi The wriggle in the upper right is reglue again. I forget what caused me to draw Marisa being a pig eating a hotdog with a open mouth and unchewed dog in her mouth. Another one I forgot what caused it to happen. Idiot hunting. Cirno is known as a idiot due to a game manual labeling her with a circle9 (9ball) and the subtext baka (idiot/stupid) Text to the right in the image reads baka baka. A horrible attempt at cute. Someone prior drew some sickeningly cute things. I failed afterword. Another new touhou. Nothing happened with this. I think the log vanished so I didn't bother with it. ok wall of TEXT over with. Edited this like this since I figured they deserved credit. BTW the silly names are nicks of people in pchat. I really like some of your art, any chance you could give me a link to your pchat? This one is 9chen, another friend (cookie) got his buddy to set up the server or something, I do not know the whole story but it is sorta dead atm. Probably spamming it at poolswimmer might enlighten that. There is old belpipi but it is frequented by furry, emo, and often trolls. Decided to take a break from textures and polygonnes. Last edited by Madkoifish : 9th Mar 2012 at 10:33 PM. larger image, not sure how much more refining I will do since this was just a distraction to doing any real work today. Anyhow anyone following my 3d crap know I have had some "issues" and well I had some 3d things planned but none of it was really READY, and getting the refinements in 2d were just not enjoyable either so here is random anime girl in WIP state. The char is from a series running this season (Japanese seasons are quarterly The Winter season is just over halfway through.) 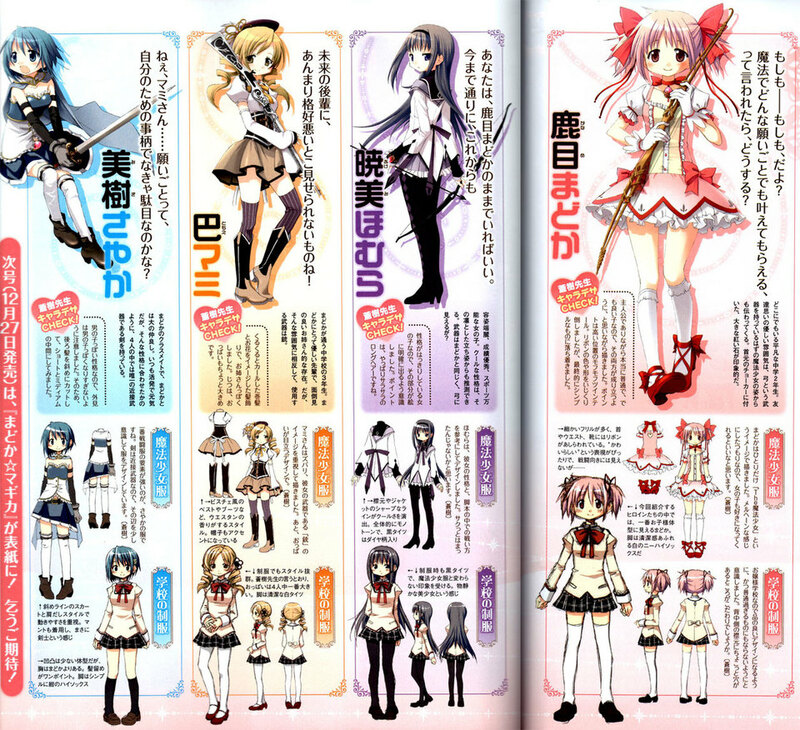 Mahou Shoujo Madoka Magica, also known as Puella Magi Madoka Magica. (Magical Girl Madoka Magica/ Puella Witch Madoka Magica) It is based of of a genra that was once generally a youth, read little girl genra. But has over the years as they grew up become a wide age group. Not to mention popularity with the whole moe thing. Anyhow this series does take a path down the dark side of mentally bent. I think it is one of the better series albet being a bit too transparent (my issue too many books I can pretty much guess what happens in any entertainment now) And it has to be one of the best things to come from Shaft in years. (Shaft is the studio doing the anime) They seem to have finally stepped away from the cookie cutter animation style and horridly method style of writing pioneered with PaniPoemi and Negima (second season) that had at one time gained them much fandom and coverage in the industry. But w/e hah Im sure it is all wall of words for you. So on to the WIP image. It probably does not look like much and the pose and expression have no meaning unless you know the story etc. But hopefully that wont matter. I love your paintings. You have a very subtle toning to your work that is unique and quite pleasing to look at. Now if I could just draw.........About once a year I convince myself that I should try again but it doesn't take long to realize that I'm lacking that gene.. So I'll just enjoy your work. Great stuff, the vampire girl is crazy. Painting is a bit harder, I'm still fighting it since I learned mostly as more of a illustrator so line work etc. For learning Id go with one of the "use shapes" to learn proportions etc. It is like anything just keep at it and find what works for you. Like 3d apps, Im fine in max and max like apps but stick anything related to linux or the mentality needed and Im a lost sheep LW blender etc. Small update, got a bit carried away sampling colours off some official images for this. Yeah not my choice in colours. overboard on the pink, but all the girls are themed like this. Anyhow, I of course am going to have to re-key all of it in the long run since Im wanting a darker environment and plan to key up some specific features. I will have to redo the one glove and sock since I decided to tint the light after I did things to these. I really want to darken the whole thing but that would mean repainting it all. sorta ehh on that, still blocking in some details as well. I have to redo the petal bits on the dress too since they do not match up. I couldn't really see in the videos you linked... but her face seems a little flat looking. She had a broad face in the videos but yours seems flatter looking somehow. The costume looks great to me though. Not copying the shows style which is wuite wide and eyes are often too far apart, signature of the designer I think. The face (skin) is not finished just a underlayment of light and dark. I have a mess to do on the eyes as well, no eyelashes etc, the reason they look all uneven atm. Anime faces tend to be flat too but right now it is the lighting which was originally ment to be keyed darker then Id add highlights to bring things up. But that plan has been dumped for now. Videos yeah I dunno the tags on all of these sites are all different for embedded viddias so you have to open the links below to see them. I managed to get them to work elsewhere but they are still a unknown thing here. I am another fan of your work, how do you find the time to do you 2d and 3d work... You have a way back machine don't you? Did I just date myself with the way back machine comment? just a few hours here and there. small update, mostly fixing things like the droopy eye. Shifted the whole head too. Still have to fix that leftside eye. Something for someone since the pink was starting to get to me. Should be recognizable. and uh didn't I have a trek doodle or prototype thread???!?!?!! eh whatever. opinions? drawn in nutrek style but can be anything really. First is a bit to reliant been there done that. Last edited by Madkoifish : 9th Mar 2012 at 10:32 PM. I will give it one more go taking a break from 3d and trek for a bit. When cleaning up I found a tattered abused copy of this book (what the image is) and re read them except the latest from the 80s. I will leave the viewer to guess for now so I wont post the sketch. Original is 4400X4800 Likely change the aspec to be taller hopefully i can bodge it in and match up the lumber hues. Full spoiler. Shouldn't be hard now. Yes, I am still alive. . . . .
Last edited by Madkoifish : 9th Mar 2012 at 10:31 PM. Good to hear and Happy New Year!